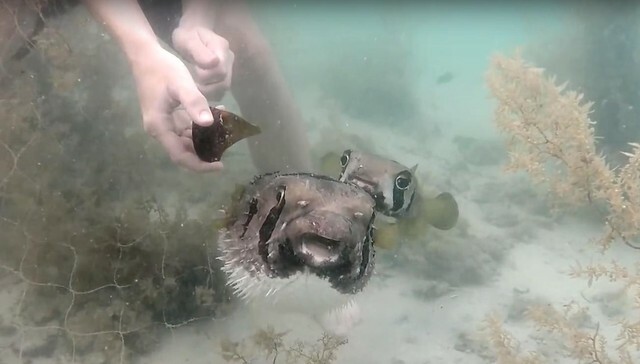 While exploring the waters of Thailand's Chaloklum Bay, a snorkeler happened upon a bittersweet scene of friendship between two little pufferfish. One of the prickly animals had somehow gotten trapped in a fishing net on the ocean floor. But rather than swim away leaving his companion behind, the other fish stayed by his side. It's unclear how long the fish had been stuck there with his friend holding vigil, though he stood little chance of surviving for long in those binds. Fortunately the snorkeler, a volunteer from the marine conservation group Core Sea, had found them in time. With no other tool handy, the man used a shard of broken glass to carefully cut the pufferfish free. All the while, even in light of the potential threat the snorkeler posed, his companion remained. Soon enough, what once must have felt like a hopeless predicament came to a happy conclusion for the trapped fish and his friend. After the last bit of tangled netting was removed from the pufferfish's body, the pair swam away into the vastness of the sea, together. As touching as this show of pufferfish solidarity is, it might not actually be uncommon. Despite long-held beliefs that fish are generally devoid of feeling or intelligence, a recent study found these animals are in fact smarter and more social than most folks ever realized. And because of that, it might be time we reconsider how we think of them. Responses to "Loyal Fish Stays By Trapped Friend's Side Until Help Arrives"
Obrigado ,pelos vossos vídeos ! Probably a mating pair but the released one did not swim right. May not make it because of the stress damage. Poor thing.